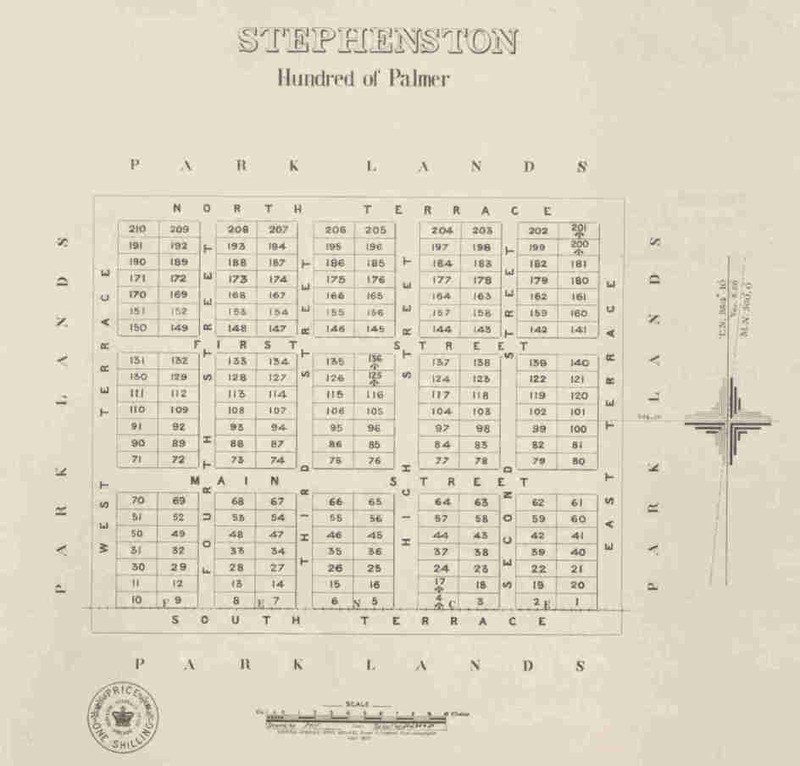 Stephenston, in the Hundred of Palmer and outside Goyder’s Line, was surveyed on 17 February 1879 and gazetted five months later on 17 July when land was also reserved for Park and Suburban lands and a Cemetery. It was named by Governor Jervois. A few months later William Scott, born 18 September 1815, died at Moonlight on 27 November 1879 and was the first to be buried there. His daughter Mary Campbell Scott, born in 1844, died in 1890. 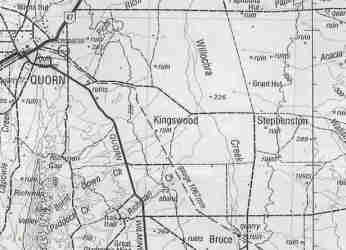 It had been hoped that a proposed railway from Terowie to Quorn would go via Stephenston but in August 1879 it became official that it would not, disappointing many of the early settlers. In November there was better news when it became known that land had been set aside for school buildings at Stephenston and Johnburgh. A post office operated from 1 November 1879 until 1904. Other post offices were opened at Baroota and Port Germein. Most of the early settlers were wheat farmers who dismissed Goyder’s warning that farming would be a risky business due to unreliable rainfall. Goyder proved right and today the area is used for sheep and cattle grazing. From the very start of Stephenston, when it was mentioned in the papers there would be a line or two about the need for rain, the lack of rain, floods, dust, grasshoppers or drought. As early as February they found that many of the wells contained salt or very poor quality water. By August good water was badly needed and the government was asked to make a dam of drill an artesian well. According to the farmers they had paid a good price for their land so they should be entitled to some water as well. By November 1880 there were a blacksmith shop, two general stores, one of which was operated by Cottrell & Fyffe, and a wine palace. Cottrell & Fyffe were also responsible for the mail. A Cricket team had been started with J Garrett as president and W Symons as captain. Unfortunately it didn’t last long; it died a natural death before the end of the year. A meeting had been held at Hudson’s store to start a Band of Hope. This would last a little longer. The monthly meeting of January 1881 was a great success as about 50 members turned up. Grasshoppers were causing much damage to the crops in November as did the lack of rain. When it did rain, it missed most of Stephenston but at least the Willochra Creek was running providing some fresh water. Several farmers were busy with haymaking although most had only very small quantities. By January 1881 drinking water was only available at Quorn at a high price. One farmer had already lost two bullocks. After barely two years some farmers expressed doubts about the wheat growing quality of the land. A number of them had sold their working stock and implements but couldn’t find buyers for their land. As business was very dull, others were leaving for the Mount Browne gold diggings. While sinking a well the Garrett brothers discovered indications of gold. Many hoped that there would be gold ‘as it would be a grand thing for us’. Cricket club or not, on 19 April 1881 the men of Stephenston played a match at Willochra and won. On 15 July 1881 a well-attended meeting was held at Whitaker’s school room to consider the wants of Stephenston. A George was voted to the chair to keep discussions on track. Naturally the water issue took up a fair amount of time as did the lack of a suitable school building. JH Garrett would like to see a JP appointed for the town. One farmer wrote to the Adelaide papers that ‘The manner in which some of the people in the northern areas are and have been served by the Government is really shameful. The people who are inhabiting, or rather dragging out a miserable existence, in the township of Stephenston and Hundred of Palmer since the selections in this Hundred were first made, have been subject to some of the greatest disadvantages that they could possibly undergo. The greatest of these is the want of a permanent water supply. Notwithstanding that two petitions duly signed by a large majority of the farmers residing in the Hundred have been sent to the proper authorities, we remain in the same forlorn and despondent condition. To the first petition we received an answer reminding us of the fact that Stephenston was considered as yet quite an insignificant township, and therefore unworthy of a water supply. Perhaps the township itself does seem insignificant when numbered among large and more favoured places, but no town within an area of over a hundred miles can boast of such a large attendance at their public meetings as Stephenston. Such gatherings would seem to promise well for the speedy development of the place were it not for one insurmountable obstacle that bars the way. Several have already left the place, and many are prevented from coming to it, simply because there is no water close at hand. Are the numerous farmers around the township also insignificant? If they are not now, most of them will be ere long if this state of affairs continues. The fact is that the township has no facilities wherewith to encourage the growth of significance, and the Government does not seem to care now that it is sold what becomes of it. We hear that no less than seventeen thousand pounds a year has been squandered needlessly in one of the Government offices alone, when for about one-eighth of that sum spent on an artesian well at Stephenston, farmers, tradesmen, and others might be benefited, and some even saved from ruin. The answer to the second petition stated that when the Surveyor-General next visited the North he would examine the locality, and so for the time we had to put up with this rather vague answer. When he was up north, Mr Goyder had been within seven miles of the place, and was then on his way to the South again. Had it not been for the kindness of Mr White, J.P, many would have had to leave the district, simply for the want of water for household purposes. The efforts that gentleman has made to obtain a permanent supply are highly praiseworthy. Among his numerous trials which have cost him about a thousand pounds, is an artesian well in an unfinished state which yields about a thousand gallons per diem, and has proved a blessing to his neighbours as well as himself. Those who are at a distance from us cannot conceive the consternation and dismay of most of the settlers here. Hundreds of cattle have died throughout the district, and the scenes around some of the watering places are sickening to behold. The stench from the dead is dreadful and almost enough to breed a plague. Surely if one Government officer can receive one thousand pounds a year as salary there should be no difficulty in voting double that amount for a water supply for Stephenston’. August was very quiet. Forms for attending a public school had been filled in and forwarded to the Education Department. Mr Symons had offered the stone if the government would erect a stone building. The present building would be closed as it was needed for different purposes. Meanwhile the number of students attending had increased, probably because there was little work to be done on the farms during this time. A Sport’s Day, organised for the children early in August was well attended. Among the prize winners were; J Hender, AA George, NV and W Hill, T Hilder, T and J Finlay, JH Garrett, J Perry and J Vincent who broke his arm and had to be taken to Quorn for treatment. As no rain had fallen so far, many feared that another bad season would ruin them. The town had been visited by a Survey Officer to see how a water supply could be best procured, but no answer had been received as yet. When they did in October they were informed that the government would not do anything at all as the small population didn’t warrant the expenditure. Towards the end of the year matters went from bad to worse. J Cottrell had removed his tin store and left town. Grasshoppers were attacking the crops, farmers were short of water and expectations for the coming harvest were less than one bushel an acre. No wonder the government was condemned for its inaction on many of the town’s issues. They kept saying that there was no money but there was for a new parliament house. Last but not least the mothers of Stephenston organised a meeting to discuss the need for a proper school. Mrs Flowers, mother of four school-aged children wanted to have them a good education in a school in town. Mrs Parsons, mother of two fully agreed. She knew at least 40 children who could attend school. As the nearby Itali Itali school would be closed there would be even more students for the Stephenston school. It was also pointed out that Round Hill, where Mrs JC Symons lived, had a school, so why not Stephenston? When the harvest had been completed in January 1882 it turned out that the average was only 1½ bushels per acre. To make matters still worse, the town was struck by ‘terrific dust storms’ during January making for hard work carting the little wheat they had to the point of sale. As a result of the poor harvest over very large areas the price of wheat was rising steadily and many farmers were now sorry they had sold their wheat as early as possible. But they needed the money. Some of the distressed farmers tried well sinking and two new wells were completed but only resulted in lowering the water levels in other wells. Most farmers were unable to till their land but would try to keep their holdings. While ploughing his land Mr Carling’s horse fell down an old disused well and a dozen people were needed to get the animal out. February remained extremely hot and dry and most of the land looked, and was, parched. Most people in town and on the outlying farms were without water. Splendid rains fell on 24 February, changing the appearance of the whole area, including Mookra and Boolcunda. Now there was a rush to get seed-wheat from the government as most farmers didn’t have any left from the previous harvest. It seemed that the town had come to life. A new post office, the first substantial stone building in town, was completed by Garrett and stone had also arrived on site for the proposed Bible Christian Church. Water remained the most important topic of any discussion. Early in March a meeting was convened to establish a farmers’ association or a branch of the South Australian Farmers’ Mutual Association, which could possibly achieve a permanent water supply for the town. Mr Corkhill was voted to the chair and informed that a small supply of water had been obtained from the Wallaby Creek but that the government still had not done anything at all. JB Garrett, S George and C Parsons were among those who wanted land set aside for their animals to graze on until water became available. All they achieved was a promise that the government diamond drill in use at Willington would be used at Amyton and then at Stephenston. By the end of March it was still extremely hot and sultry but still no rain and no word from the government. There was little incentive for farmers to keep going and seeding was progressing in a desultory way. When a teacher was appointed and a building found only 20 children rolled up as several families had already left town. It was not until May that seed-wheat was distributed among the distressed farmers. By June it was realised that its quality was very poor, just plain rubbish. Some of the bags contained oats and drake, smutty seed and most were full of weevils. In June it was reported that ‘Our once lively town is now altogether deserted for the last remaining ones cleared out about three weeks ago to seek fresh fields’. Although no one was living in town the school was still open and about 16 students attending from the surrounding farms. By September farmers were crying out for rain and in low spirits. Many were now also talking about leaving for other colonies. By the end of September the ‘terrible dust storms’ had returned, covering anything and everything and causing a lot of damage. In one of these storms Garrett’s blacksmith shop lost its roof. All hope of even a small harvest had been wiped out. While working on his reaping machine Thomas Dalton got his hand caught in the cog wheels and had to go to Quorn for treatment. The Daltons had their share of bad luck. Only a few months ago their three year old son nearly drowned in their underground water tank. He was only saved by his mother jumping in after him. November proved to be ‘unbearably hot’ and cattle looked very poorly. This time it was decided to approach the government for building a reservoir similar to the one at Bruce. As the distress among the farmers increased by the day farmers became more outspoken. They were supposed to cultivate the land, but who could without water or cattle. It was stated that the great loss of cattle around Stephenston was something terrible. Farmers were reduced to ‘poverty and their families to beggary’ while the Commissioner quietly looked on without the least attempt of assistance. The year closed with badly needed rain but this time there was far too much. Large areas between Moockra and Hammond were flooded. Huge rocks, fencing, wheat crops and timber disappeared in the flood and many trees were uprooted. There would be plenty of work in 1883 to repair all the damage.